Telenor has introduced free insurance for its pre-paid customers for the first time in India, under the name called SURAKSHA. This scheme has introduced by telenor to attract the Indian customers after its change of its name from uninor to the telenor. This scheme was already launched in Pakistan by telenor under the name Talkshawk Mohafiz in 2013 and proceeding successfully in Pakistan. Many of them has already claimed the insurance and got benefits of the insurance in Pakistan. Telenor will begin offering life insurance to its new and existing customers, which covers starting from Rs 5,000 going up to Rs 50,000, while consumers don't need to pay any premium. They just need to recharge their phone numbers and the insurance cover will be 100 times of the amount recharged, for any queries you can contact the nearest telenor store and get clarified. 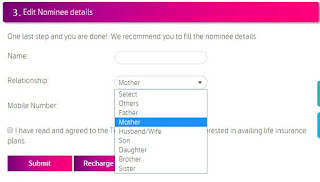 In order to option in for the free insurance in India, you must be the telenor customer and you need to option in for the insurance by dailing *121# and then you need to follow the options to reach the free insurance category. By dailing *121# you can option in for the insurance and also check for the status of insurance. In order to get covered in the insurance you have to reach the certain amount of balance recharge by the end of the month. After getting option in from the *121#, You can check the status of your insurance and the amount to be recharged in order to be get covered in the insurance by dialing *121#. If you get reach the recharge amount to get eligible for the insurance, The scheme will be activated in the next upcoming month for the 30 days. Free Telenor suraksha life cover starts its 1st day on the 1st day of next month upon activation or on achieving your recharge target on your sim. It has also noticed that the telenor customers are being insured by the shriram life and micro ensure under their guidance and partnership. Existing customers begin their cover from the next month from the time they opt in. New customers automatically get a cover of Rs 10,000 for two months and subsequently they have to opt in to continue the service. Customers have to maintain a nominal minimum amount every month for keeping the insurance cover valid and can increase it by increasing the recharge they do every month. 1)In case of demise of telenor customer, nominee can avail life insurance coverage amount after submitting the death certificate, nominee id proof and sim card to the telenor care. The company verifies the documents and does the settlement within 7days after the completion of verification. For any other clarification and doubts, you can visit any the 2100 telenor stores in the country. 2)If nominee is not updated for an Insured then a blood relative of the insured who has filed the claim of deceased person will be checked by Micro Ensure, and only if nominee's relationship with insured is established then the claim will be disbursed. 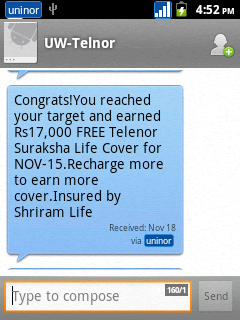 Congrats!You reached your target and earned Rs17,000 FREE Telenor Suraksha Life Cover for NOV-15. Recharge more to earn more cover. Insured by Shriram Life. You can also get the information from the official telenoe website. 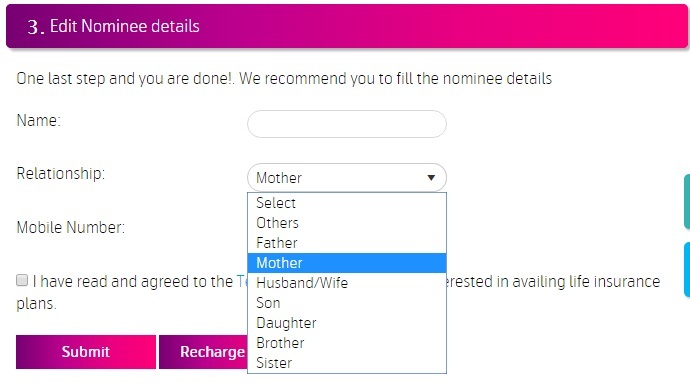 You can give nominee related information on the official telenor website by logging on to the site. For this you need to pass through the otp verification process for the security reasons and then toy can choose the nominee and give provide nominee related information which will be useful while claiming the insurance. 1. The benefit is available to members through Group insurance product, which is a non-participating non linked insurance plan. 2. Members, who are in the age group of 18 years to 79 years are eligible for life insurance cover. 3. A member shall be admitted to the benefits of this policy with effect from the date of admission as a member of the Group and the Group Policyholder shall advise the SLIC to this effect and furnish the relevant particulars of the member. 4. Life cover is active as long as the Master Policy Holder pays the premium regularly and the death benefit is payable should the death occur during this period. 5. Only death benefit is available. There are no other benefits like maturity, surrender value and loans. 6. In the event of death of the member, during the term of the policy, the sum assured will be paid to the nominee. 7. In the event of death, the nominees are requested to contact the service centres for claim form and process details. 8. For claims, the Death Certificate of the member should be submitted in original death certificate along with the claim form which will be available at the service centres. 9. The benefits assured hereunder are the strictly personal and cannot be assigned, changed or alienated in anyway whatsoever by the members. 10.All disputes which may arise in connection with this policy shall be submitted to the exclusive jurisdiction of the Courts of Hyderabad, Telangana. Tags: uninor free insurance, telenor free insurance, uninor suraksha india, telenor suraksha india, uninor Talkshawk Mohafiz, telenor Talkshawk Mohafiz, uninor free insurance scheme india, telenor free insurance scheme india, telenor insurance scheme india, uninor insurance scheme india, telenor life insurance details, telenor suraksha bima, telenor suraksha bheema.